Ezion Holdings Limited (Ezion) held the analyst briefing on 24-Oct, sharing recent updates of negotiations involving various stakeholders including banks, creditors, and shareholders. At present, Ezion has not defaulted on any existing notes nor bank loans. Operationally, it managed to fulfil the contract terms, making delivery and deployment on time. However, the group will undergo several key meetings to secure consent from creditors and shareholders to restructure its debt Jan-18. Banks offered a conditional refinancing plan: 6 banks will provide up to US$100mn to the group to fund its working capital. Meanwhile, banks are willing to take 200bps reduction of interest rate, which lightens Ezion interest burden of up to US$30mn per annum. Moreover, banks can receive staple warrants to a portion of their loans if they decide to further lower interest rates. Ezion must repay a minimal fixed principal every month over the next 6 years. As a result, the group expects minimal positive net cash flows accordingly. However, all the terms are on the condition of the approval of consent solicitation statement (CSE) from noteholders of all series (Figure 1). 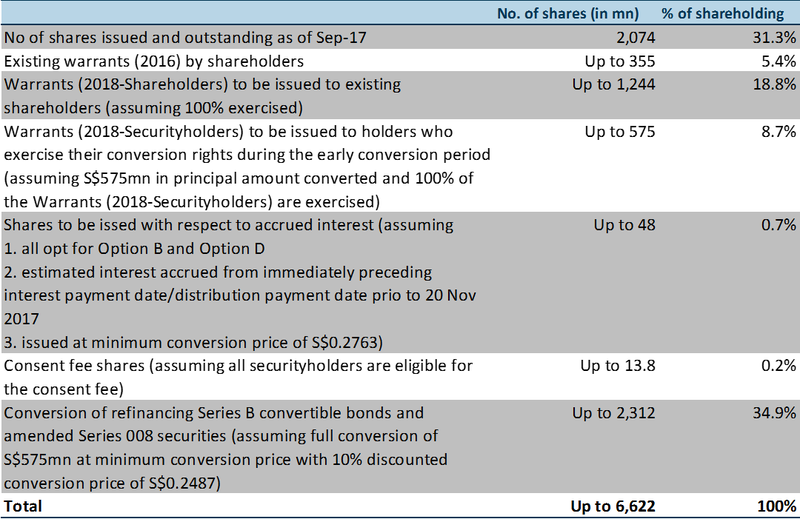 Ezion proposed options for creditors: As of Oct-17, the notes due within 4 years are shown in Figure 1. The group provided a proposal of notes restructuring for Series 003 – 007 and Series 008 respectively. The proposal included straight bonds of 7 and 10 years (0.25% coupon), convertible bonds (CB) and bonus warrants for early conversion of CB. It is worth noting that the warrants are detachable and non-tradable. 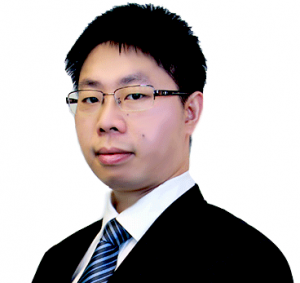 Ezion will raise additional S$344mn if warrants are fully exercised at the price of S$0.2763. As a result, the proposal will trigger potential dilutions of existing shares, see Figure 2. However, the prerequisite for the implementation of these plans is to clear the overhang of liquidity issues mentioned above. The resumption of trading suspension will be no earlier than shareholder’s EGM. Therefore, neither recommendation nor rating is available as of now.